Will Drones Be the Traffic Jam in the Sky? a traffic jam of drones instead of flying cars? Amazon released new and real footage of their proposed drone delivery service this week and it got me to thinking about how such a thing would scale up should it become a successful business model. What if other companies followed suit? What if local delivery of everything from pizza to... well anything you can send through the mail now becomes more efficient to deliver via drones? Will we look up into the sky one day and instead of seeing that promised traffic jam of flying cars we'll see hundreds of drones zipping about between buildings above our heads? I'm going to go out on a not so shaky limb and predict that a traffic jam of drones in our skies will be the precursor to the flying car traffic jams of movies like The Fifth Element. 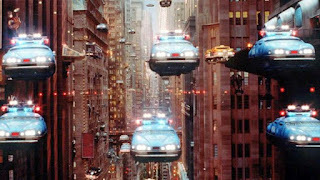 That said, until someone can either scale up a drone to carry the weight of at least four people, or someone invents anti-gravity vehicles, flying cars are just never going to happen. In the meantime watch Jeremy Clarkson explain how Amazon Prime Air will work and think about just how many deliveries they'd be sending out a day. Now think about every other distributor of small goods sending out their own drones.... it's a traffic jam in the sky and it's beautiful!